Lookit that -- it's a finished sweater! Isn't it awesome? She made some adjustments to the pattern, and I'm hoping that she'll pass on her numbers to me so that I can see if I can use them to add another size to the pattern. Anybody else out there working on it? PS - Speaking of charity, if you're a DC-area knitter, check out this awesome opportunity to use up some stash and do an awful lot of good for the chronically ill... and DCist has posted some scarf patterns to get you started. Get your knits in by February 6! Oh, I am so sorry about not getting the numbers to you yet!!! Been a wee bit busy. I will pull them out and start putting it together for you. Sorry, sorry... meanwhile - I have worn this sweater numerous times. I still LOVE it! I'm also a knitter who has been transplanted to DC from Boston. My mom and I knit together and took classes at Newbury Yarns, but I have no knitting buddies down here and it's lonely. I know you have high standards (I read the blue blog and thus am familiar with the legendary Knitsmiths), but I was wondering if you'd found a good knitting group in the area? BTW- I am super jealous of your basement knitting nook. I live with my boyfriend in a one bedroom and thus am lucky to have a knitting basket! 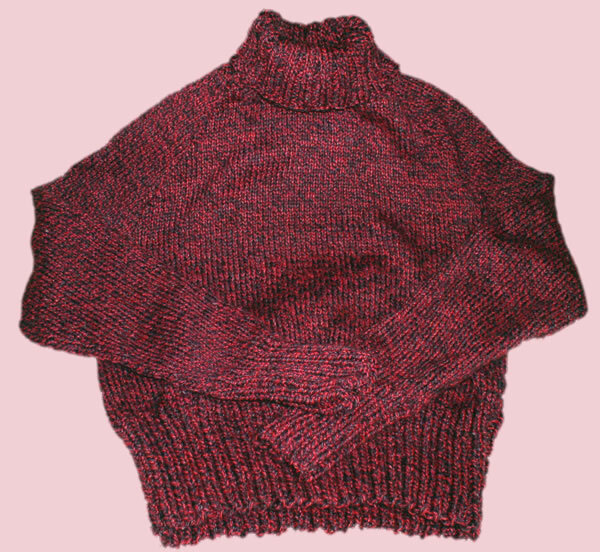 I wanted to let you know that I have just finished knitting your sweater in Lorna's Laces Shepherd Worsted in Brick. I had to rejigger the pattern to accommodate my gauge, but I'm quite happy with the result. It was my first time with short rows, so I struggled a bit, but as a newish knitter I learned some techniques--namely, mattress stitch. This was the third sweater I made! I love Enid's version. It looks great! I'll e-mail you a pic of mine soon.